A long-felt demand of the Haj pilgrims is soon going to be fulfilled with the coming up of a Haj Bhavan in Hailakandi town of Assam. 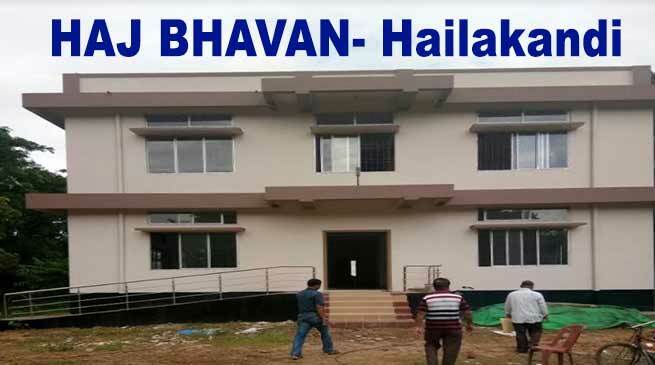 Built at an estimated cost of Rs.1 crore by the PWD (Buildings), Hailakandi Division, the keys of the bhavan were handed over to the Member Secretary, District Haj Committee and Additional Deputy Commissioner, Amalendu Roy by Assistant Executive Engineer of PWD (Buildings), Badrul Haque Choudhury on Friday. Only what remains to be done is the construction of the boundary wall along with furnishings before the bhavan is thrown open to the pilgrims. The decision to formally take over the newly built bhavan by the district administration was taken at the District Development Committee meeting chaired by Deputy Commissioner, Adil Khan on Friday itself. Roy inspected the rooms, electrical fittings and water supply provision with Nazir of Nazarat Branch, Debdas Singha. The Additional Deputy Commissioner thanked the members of the District Haj Committee for their support and cooperation towards construction of the bhavan. He also complimented the donor of the land Siddique Ali Barbhuiyan. Spread over an area of 14,400 sq.ft., the two-storey bhavan comprising four dormitory halls, conference hall, office room, kitchen and three toilets, can accommodate a little 50 pilgrims. The construction of the bhavan began in May 2015. The number of Haj pilgrims from Hailakandi has been on the rise in recent years. 281 pilgrims – 233 males and 48 females – will be going for the annual Haj this year.